10 Days in Morocco - Guide & Tips | Travel. Made Simple. From bustling markets of Marrakech and Fez, the peaceful blue city of Chefchaouen, to the costal town of Essaouira, there’s plenty to see during a 10 day backpacking trip across Morocco. What to expect from this itinerary: You’ll spend a few days on a crash-course-welcome to Morocco by visiting the busy streets and aggressive street vendors of Marrakech. After a quick trip to the western shore, you’ll head out on a multi-day backpacking trek across the Sahara Desert on camelback to get you to the old medieval capital of Fez (Fes). From there you’ll visit the beautiful blue town of Chefchaouen before heading home (or to your next destination). Accommodation: 70-100 MAD for dorms and 120-350 MAD for privates in major cities. Prices range quite a bit depending on what city or town you’re in. Food: 35 MAD tangine (a local staple made up of meat, veggies, and rice). Sit-down restaurants will charge 100 MAD for a meal. Transportation: You have several options to get you around the country: buses (CTM), trains (ONCF), or “Grand Taxis” (where you pay by the seat) can get you around easily. Etiquette: Tipping is common (and often required for public bathrooms), so carry small change; 5 MAD is usually acceptable in most situations. Dress conservatively: women should keep their legs, arms, and shoulders covered. If offered mint tea, be polite and accept the offer of hospitality. What to do: Haggle hard in the local markets, visit the local hammam (bathhouse) for a spa treatment, travel the desert between towns via camelback. See the Jemaa el-Fna of Marrakesh, camp in the Sahara, see the blue city of Chefchaouen, hike the High Atlas Mountains, surf in Taghazoute, and explore local history everywhere you go. When to visit: Late March through May, or early fall. 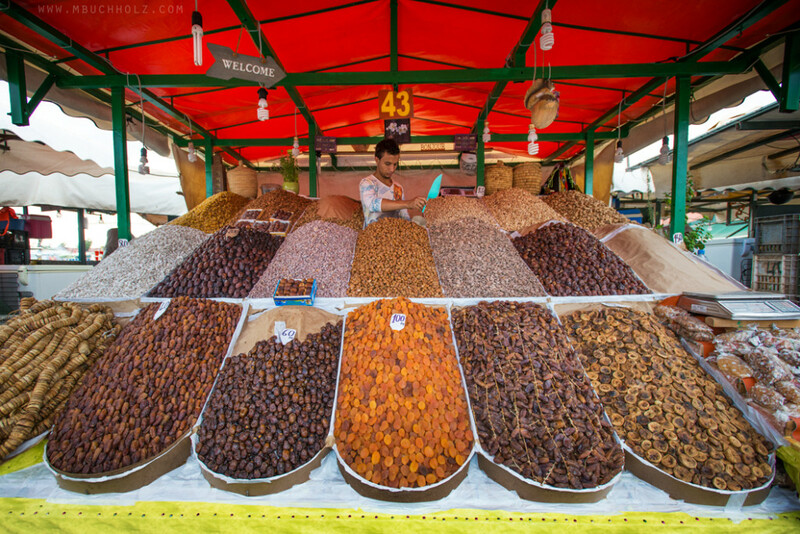 Feel the bustle of one of the country’s best markets as you explore western Morocco. Upon arrival—and really for the duration of your stay—expect to get completely lost time and time again. Streets are not well labeled, you won’t see signs pointing you the right way, and the alleyways twist and turn, getting you utterly turned around. As a result, you’ll find many eager locals willing to offer you their service to guide you for a small fee. Be aware some of these are faux guides who will lead you to businesses that have already paid them off. Getting there: Fly into Marrakech airport and grab a taxi to the medina. If traveling by train to the area, hitch a taxi from the station to the square. Where to stay: Riad Argan. Email the hotel in advance to notify you of arrival and they can make arrangements to have you picked-up from the airport and escorted to the riad. Where to eat/drink: Hands-down the best place to eat is in the food stalls that will fill the Jemaa el-Fnaa at sundown. There will be more food stalls than you can try in your trip, and for the most part, you can do no wrong. During the day, check Cafe Arrabe. 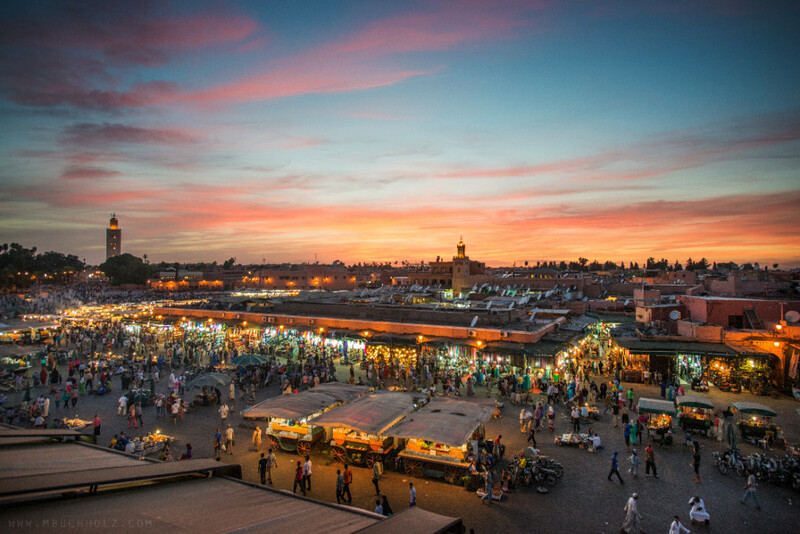 What to do: Walk through the Jemaa el-Fnaa and local markets in the Medina . Enjoy street food and take a day trip to the High Atlas Mountains. Take a local cooking class. If you have time, take a multi-day Sahara tour (min: 3 days / 2 nights) and travel via camelback to Fez, staying in local villages along the route. What to do: Explore the city streets and take plenty of pictures, travel to the well-known nearby waterfall, climb the mountains. Spend a day on the Moroccan coast in the small town of Essaouira and watch the sunset over the sea. Fans of “Game of Thrones” might also recognize the town from the TV series. Getting there: Have your hotel book transport for you the day before, and either take a 3hr bus-ride (CTM) from Marrakech for 75 MAD or grab a grand taxi for 100-150 MAD/per person. From the bus station, grab a 15 MAD taxi into the medina. Where to stay: Riad Malaika for 700 MAD or Riad Al Zahia for 500 MAD. Where to eat/drink: As anywhere in Morocco, stick to the street stalls and try the soups,, sardines, tanjines, and fish. What to do: Explore the town and hear some local music. Skip tanning and swimming in the strong winds and instead go kitesurfing. It’s time to begin the trek to Fez, but rather than hop a bus, we’ll head to the desert and spend three days traveling by camel, giving you the opportunity to really get to know the landscape. Along the way you’ll stop at local villages, head over the beautiful Atlas Mountains, have plenty of amazing picture opportunities, and spend each night camping in the desert. You’ll be sore by the end of it, but it’ll be an experience you won’t soon forget. Where to stay: Expect to camp each night in the desert. It will get very cool at night, so dress appropriately and have something warm for your feet. Where to eat/drink: Your guides will take care of food and water for you on your stay, so there’s nothing to worry about. What to do: Explore villages, take pictures, get to know your other travelers, and reflect. Explore the medieval capital of Morocco and one of the most well-preserved cities in the Arab world. Walk through the car-free Fes el-Bali and dodge mules and handcarts along the way. While it’s an amazing city to explore, Fez (or Fes) will feel a bit reminiscent of Marrakech, so with limited time, just spend a night here before moving on to your next stop. Getting there: If you followed our itinerary, you would have arrived by camelback, but in the event you strayed, you have a few options to get to Fez. Trains run multiple times a day from Marrakech and take about 7 hours for 200-300 MAD. Alternatively, you can hop a shared grand taxi for approx. 150 MAD/seat or grab a CTM bus for a 5hr drive. Where to stay: Ryad Alya for 600 MAD. Where to eat/drink: Explore the streets and eat at the local street stalls. What to do: Get lost in the medina, see the 14th century college Bou Inania madersa, visit the Merenid Tombs, visit the tanneries. Travel to the northeastern side of Morocco to the beautiful mountain town of Chefchaouen and explore the gorgeous blue streets of the medina with a view of the Rif Mountains in the distance. Be aware that drugs (particularly marijuana) are popular in this town, and you’ll likely get approach quite often on your trip by sellers. Getting there: Catch the CTM bus (80 MAD) or grab a shared Grand Taxi. Plan for a 4hr travel time. From the bus station (gare routiere) grab a 10 MAD ride in a petit taxi to the medina. Where to stay: Hotel Alkhalifa for 500 MAD if you’re up for stay a short walk from the city on a beautiful hillside, or Riad Assilah Chefchaouen for 600 MAD right in town. Where to eat/drink: Get seafood tagine at Granada or Chez Faud, pastries at Pastry Ladies, or shop at one of the many food vendors you’ll see along the streets. What to do: Explore the city streets and take plenty of pictures, travel to the popular waterfall on the east (Ras el Maa), explore the ruins of the Jemaa Bouzafar, and hike through the Rif Mountains or up the Jebel al-Kalaa. While most people you talk to will not recommend Tangier as a travel destination (it’s town now overwhelmed with tourists, businesses, and feeling wholly unauthentic), it’s the closest place to fly-out of (unless you want to bus back to Marrakech), so plan for just a quick trip to catch your flight out. Getting there: Catch one of the multiple daily buses for 30-50 MAD to Tangier, 3hrs away, or grab a Grand Taxi for 100 MAD/per. Anything we forget? Ideas of other places to check-out? Things not to miss? Leave it in the comments! Sleep in a riad: Traditional Moroccan house built around a garden. Barter: Everything is negotiable. In popular tourist markets, start negotiating at 1/3 of the quoted price. Agree on a taxi fare before you get in. Be aware of faux guides trying to offer to take you somewhere, as they’ll likely just take your money and lead you to a friend’s business. Beware of pickpocketing: Do not walk alone at night and be careful to keep anything of value very close to you. Small children are just as likely to be pickpockets as anyone else. Be aware as well of a common trick in smaller towns where locals will try to befriend you over a day or so before stealing from you. Eat from street stalls: Street stalls are everywhere and offer the best food for little price. Great blog! Awesome & useful information, thank you so much for sharing your amazing experience in Morocco!